Below is the A.I.M. 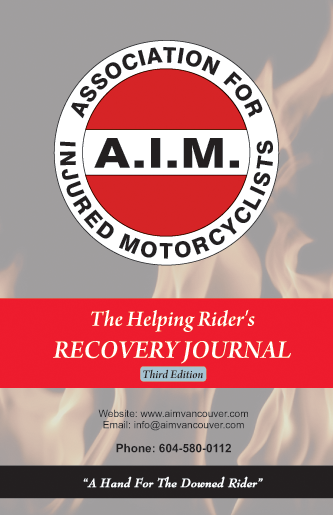 Recovery Journal which is provided to each downed rider in hospital. It contains information about Income Tax Issues, Benefits, and Resources. Additional information regards how to choose a lawyer, legal resources, your Rights, patients' Rights, ICBC claims process, license recovery (car - Class 5, and motorcycle - Class 6), and motorcycle modifications for handicap. At the end of the Recovery Journal are three articles, written by lawyers, explaining how the ICBC insurance system works: coverage, claims, and motorcycle claims. After you have searched through the highlighted "Income Tax Issues," "Benefits," and "Resources" sections, we encourage you to read the entire Recovery Journal as it contains a lot of valuable information that can help with your recovery.